Daryl Dixon may not have appeared in The Walking Dead comics but after nine years on the AMC series, both Daryl and Norman Reedus are richly engrained in The Walking Dead’s history. While I have thoroughly enjoyed watching his character evolve into the man he is on the show today, there is truly nothing more entertaining than season 1 & 2 Daryl who 9/10 times is being held back by Rick. 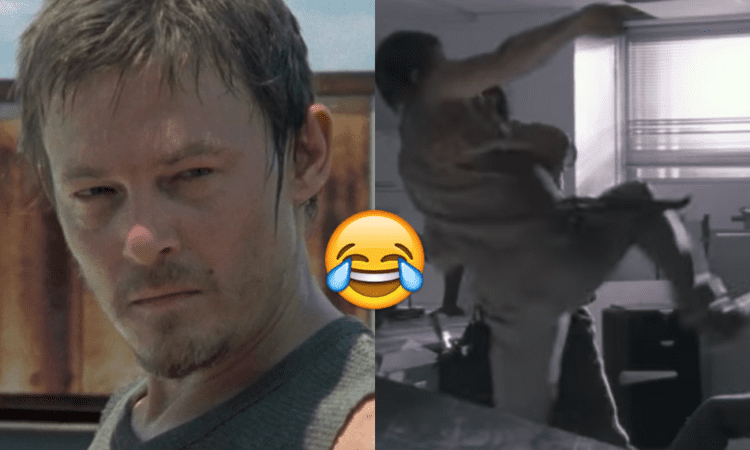 While recently rewatching season one, specifically after the episode “Vatos” I couldn’t stop laughing about the scene where Daryl literally threw Merle’s hand on a person as a threat. This article really serves no other purpose than to relive this iconic moment together. Let’s set sail. Quick recap since this was essentially 10 years ago. Rick, Daryl, T-Dog and Glenn have gone back to get Merle from the roof only to discover that he had to cut off his hand in order to escape. Rick agrees that they will help track Merle down, but they have to get his bag of guns first. While doing so, they cross paths with another group trying to get the bag of guns. After a scuffle, two of the men take Glenn and the guns and drive away, leaving Rick & Co. with a youngster from the group named Miguel. They question him. Miguel then says that Daryl is the one who jumped him, “screaming about trying to find his brother like it’s my damn fault.” Daryl then makes a fair case that this guy’s group literally just took Glenn so they could have taken Merle too, but once Miguel hears that his name is Merle he makes this mistake. This sassy line results in a roundhouse kick attempt from Daryl, which I would unequivocally rate a 10/10. God bless Rick and his patience. He leaves him with one final threat before Rick once again pulls him off. Then Rick steps in to settle things in the most Rick Grimes way. Man, I miss him. Anyway, I hope you enjoyed this trip down Daryl memory lane as much as I did! You can check out the whole clip below.